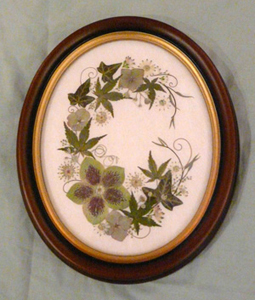 The Guild was established in 1983 by Joyce Fenton, a well respected pressed flower artist and Bill Edwardes, who devised the method of framing pressed flower pictures, which has been adopted by the Guild. It now has members throughout the UK and in other parts of the world. To raise the general standard of pressing flowers by enabling members to meet and share expertise and experiences. To arrange teaching and seminar facilities for members and to encourage the formation of local groups. To enable members to be part of a Guild which has a reputation for ensuring the highest standard in preservation of natural materials, presentation and "finish" of the product. The Guild Magazine is published quarterly and offers involvement for members. It is a vital link for members who are unable to attend a group meeting or get to conferences. It contains articles about pressing flowers and storing and using pressed plant material. News of group activities and conference reports, letters from members, photographs of events and members' work and the latest ideas about pressed flower work are also included. The Pressed Flower Guild Yahoo Messenger group keeps some members in touch by email. There are twice yearly Conferences, one of which incorporates the Annual General Meeting. Awards are judged at Conferences and successful members are entitled to use the Guild logo on letter headings or personal cards, whilst they remain paid-up members. Regular meetings are held in their areas - these are usually practical sessions, based on a theme agreed by the group. They encourage exchanges of views and knowledge, and give enjoyment in sharing an interest.